Unit Air Conditioner is a self-contained system appropriate for server rooms and other spaces with dense heat loads. 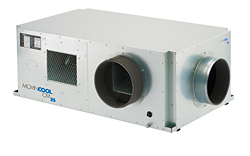 The CM25’s total cooling capacity is 25,000 Btu/h and sensible cooling capacity is 18,9000 Btu/h. It has a 14 SEER rating. No refrigerant connections are required. The ceiling-mounted unit is 20 inches high with built-in mounting brackets, flanges and vibration insolators, and has a wall-mounted controller. Low cost, according to the company.